What books are helpful for parents to read in their quest to raise children with good bilingual ability? See these posts for suggestions! If you’re feeling discouraged or frustrated about your bilingual or multilingual aim for your kids, this video can help. It offers a fresh, empowering perspective that comes from a chapter of my popular book Maximize Your Child’s Bilingual Ability: Ideas and inspiration for even greater success and joy raising bilingual kids. 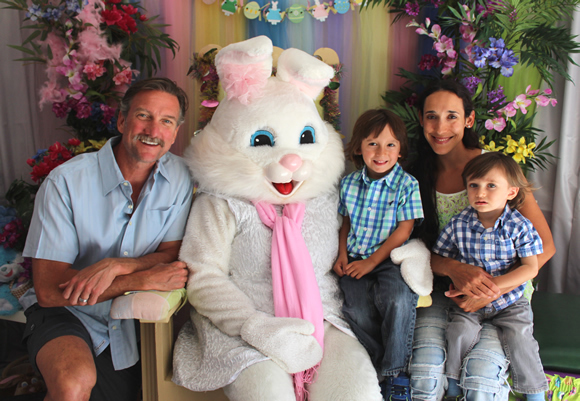 Remember, you can always find friendly support, too, at The Bilingual Zoo, the web’s liveliest community for parents raising bilingual and multilingual children. View this video at Bilingual Monkeys TV and subscribe to my YouTube channel. 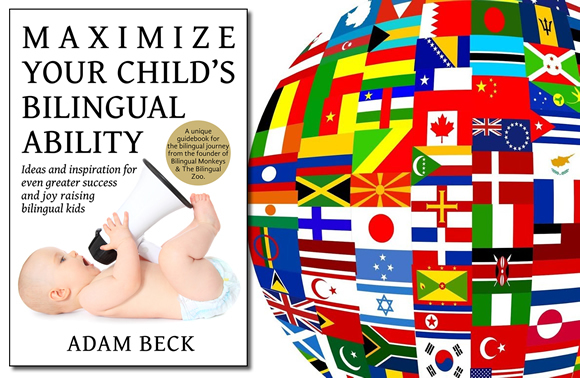 Learn more about the book Maximize Your Child’s Bilingual Ability. Get the book at Amazon. Get the book at the Book Depository. Contact me to place a bulk order. Sales of this book help keep our online community going and growing! Thank you for your support (including your reviews, which I really appreciate)! And warm wishes to you all! Since its release in April 2016, the original English edition of Maximize Your Child’s Bilingual: Ideas and inspiration for even greater success and joy raising bilingual kids has earned passionate praise from both parents and experts in the field and generated strong sales around the world in both paperback and digital versions. Bilingual Adventures, the publishing imprint behind the book, is now inviting offers, from publishers worldwide, for the foreign language rights to this popular book on a topic of immense interest in today’s global community. 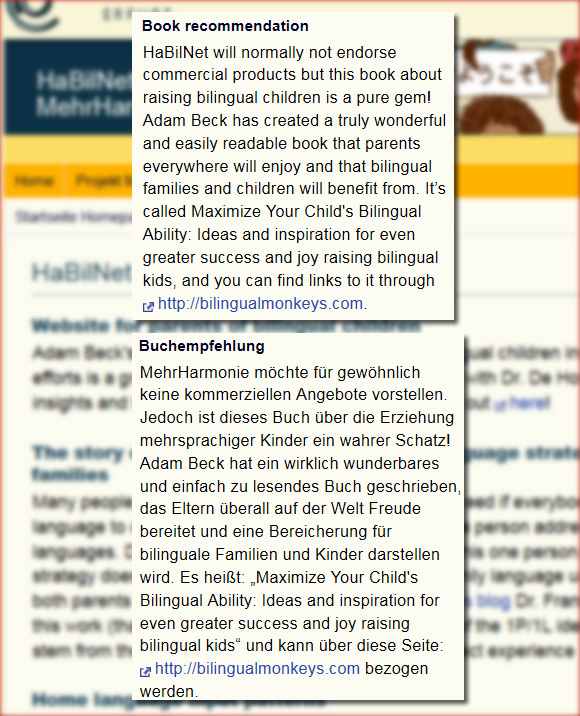 Details on the contents of Maximize Your Child’s Bilingual Ability, as well as numerous reviews, can be found on this page at Bilingual Monkeys. Specifics on the publishing rights currently available, along with a chance to view the first 45 pages of this 310-page book, are noted on this page at Pubmatch. One of the deeper themes of my efforts to support the bilingual and multilingual journey of families in the world—as I stress in such posts as Why Raising a Bilingual Child Matters in a World Gone Mad and Why Your Bilingual Child Is Tied, Profoundly, to Hiroshima and Peace—is the idea that children with ability in more than one language can potentially feel keener empathy for others and contribute to creating a more harmonious world through their outlook and actions. I realize, of course, that the world is still very far from the peaceful place we wish it was—and I admit to wrestling with a more jaded side, too—but I nevertheless continue to believe that the efforts we make, including our efforts to raise bilingual and multilingual children, do make a productive difference to the larger arc of our evolution as a species. 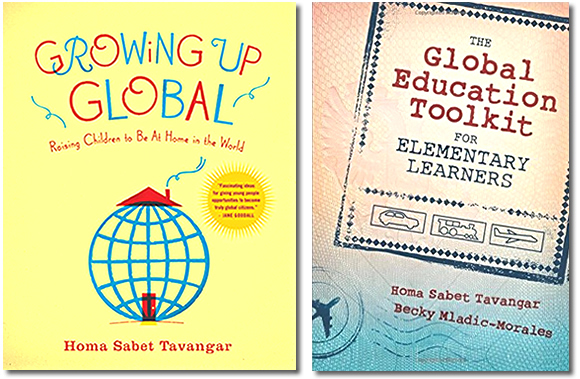 This same idea—that expanding our familiarity with the world and our empathy for others can help promote greater peace on this fragile planet—is the essential aim of two books on nurturing a spirit of multiculturalism that I wholeheartedly recommend: Growing Up Global: Raising Children to Be At Home in the World and The Global Education Toolkit for Elementary Learners. HAPPY BIRTHDAY! Maximize Your Child’s Bilingual Ability is now 1 year old! 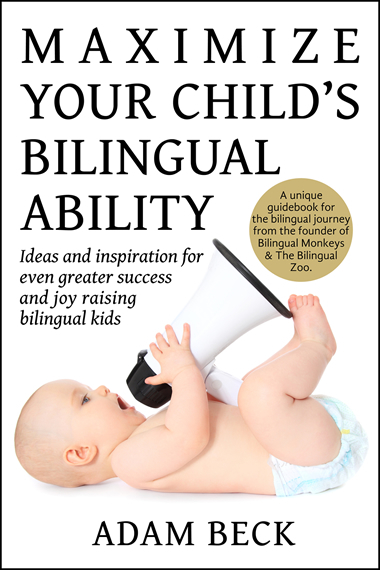 Since it’s release exactly one year ago, Maximize Your Child’s Bilingual Ability: Ideas and inspiration for even greater success and joy raising bilingual kids has provided a powerful boost to families around the world. While the book has been widely praised by many parents and experts in the field, today, on this first anniversary, I’d like to spotlight the impressions of one particular reader, a mother of two young children in the United States. Her experience of the book—how it has empowered her family’s bilingual journey—is exactly why I wrote it and her comments are so gratifying to me. Deborah, who’s originally from Brazil but has lived in the U.S. for the past 10 years, was kind enough to allow me to share these comments today along with a photo of her lovely family (and their large fluffy friend). 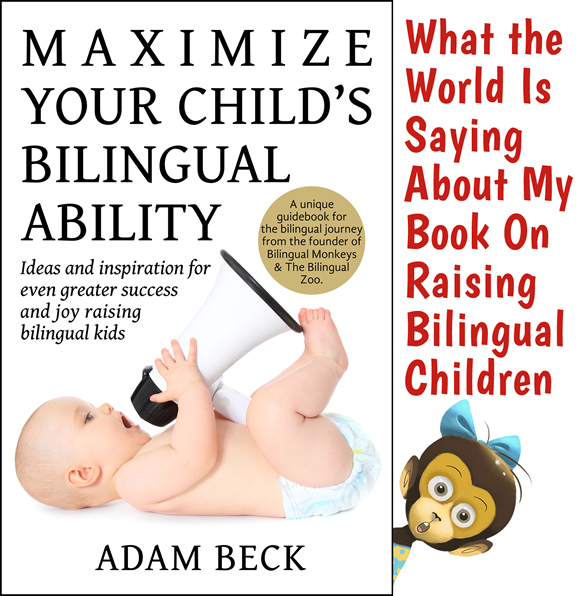 I can’t say enough good things about Adam Beck’s book Maximize Your Child’s Bilingual Ability. Before I read it, I was hopeless that my almost 4-year-old son would become proficient in Portuguese, my mother language. 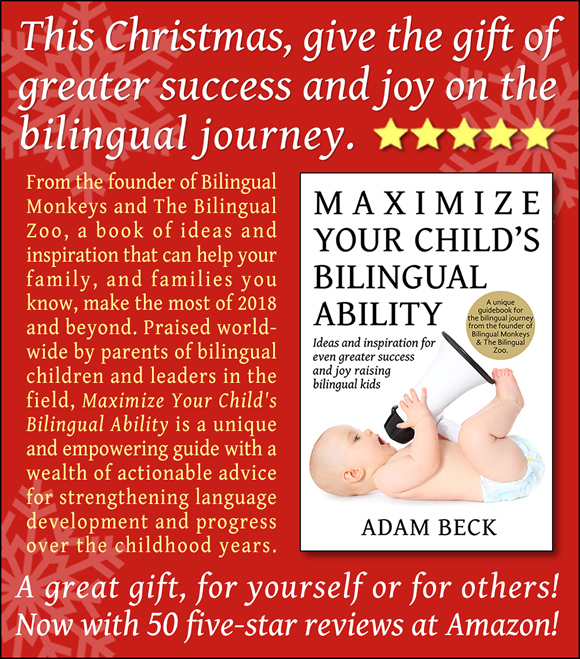 However, after reading Adam’s book and putting into practice every tactic suitable to our circumstances, I noticed extraordinary progress in my son’s language (Portuguese) ability. He is now 4 years and 5 months old and not only does he speak Portuguese only with me, but he has also started to read Portuguese (he can read English really well) and interacts with his little brother, 20 months old, in Portuguese most of the time. I am beyond excited with such striking progress and forever thankful to Adam for raising awareness on bilingualism and providing invaluable tools for our bilingual children to thrive. BREAKING NEWS: There’s a wonderful new review of my book Maximize Your Child’s Bilingual Ability: Ideas and inspiration for even greater success and joy raising bilingual kids at the popular site Spanish Playground. This review is especially gratifying to me because Jennifer Brunk has captured the content and spirit of the book so well in her impressions. To get your copy, head to Amazon or another bookseller. Thank you! 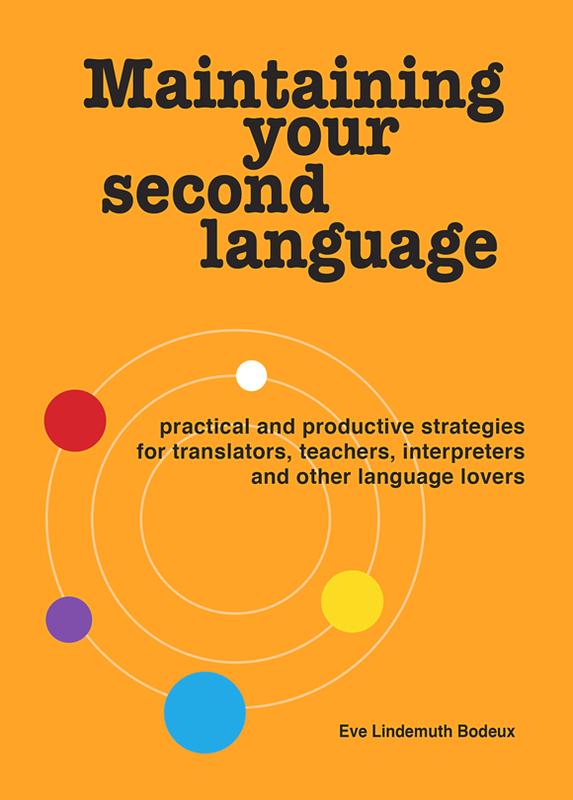 NOTE: Below my review of Maintaining Your Second Language is a special list of tips by the author, Eve Lindemuth Bodeux, for motivating and maximizing language learning. 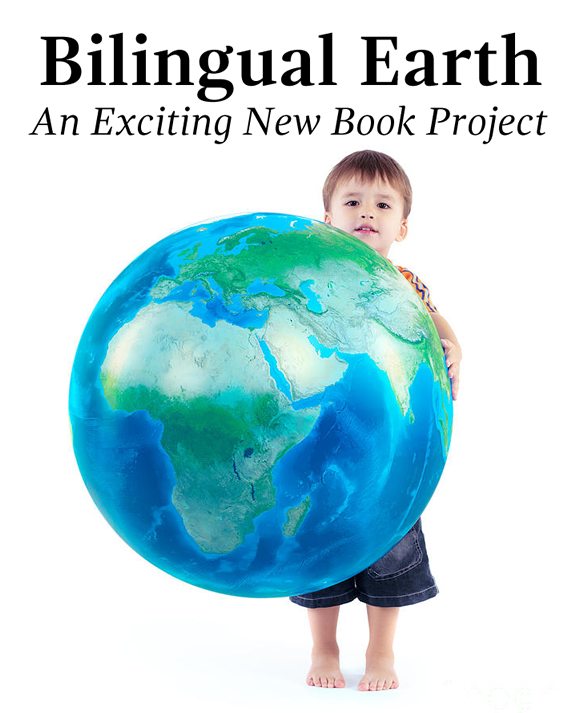 Are you a parent seeking to raise a bilingual child in a non-native language? A teacher who teaches a language that isn’t your mother tongue, or a subject where you must use a second language in your instruction? A translator or interpreter who wants to continue sharpening your language skills? Or maybe a student or language lover who would like to improve your ability more quickly and more enjoyably? If you fit one (or more) of these profiles, I urge you to read the book Maintaining Your Second Language by Eve Lindemuth Bodeux. Eve, a professional translator and parent to two bilingual children, has done the language-learning world a tremendous service by compiling a treasure trove of practical tips and tools for sustaining and strengthening one’s second (or additional) language. For this new quiz, I’ve created questions based on information found in Annick De Houwer’s book Bilingual First Language Acquisition. To read my impressions of the book, see Recommended Resources: Books on Bilingual Acquisition by Prominent Researcher Annick De Houwer. That post also features an insightful interview with the author. Ready for the quiz? Good luck! 1. BFLA stands for Bilingual First Language Acquisition and, in Dr. De Houwer’s words, refers to “the development of language in young children who hear two languages spoken to them from birth.” On the other hand, when monolingual children begin to acquire a second language on top of their first language, not from birth but from a young age, as in day care or preschool, what is this process called? To check your answer, open this box by clicking the plus sign! 2. Jules Ronjat, a French linguist, wrote the first book about BFLA, a case study of his son growing up with two languages from birth. When was this book published? The world’s interest in children's bilingual development has grown profoundly since that time! 3. What is the term used to describe the exaggerated way of speaking, marked by a higher pitch, that adults tend to use when talking to babies? Isn’t it remarkable how adults will automatically switch to this special way of speaking when interacting with babies?